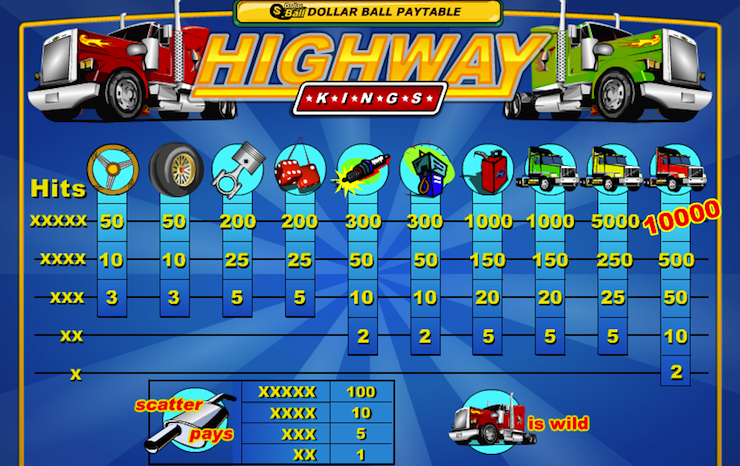 Highway Kings is a video slot based on long distance truck driving. Spin the reels of Highway Kings and the fast animation is accompanied by the sound of a truck engine igniting. The reel animation is very fast, and one can only imagine a trucks wheels turning in tune to the reels. When the reels come to a halt, the sound of a trucks airbrakes is heard. It is a 5 reel and 9 line slot that offers a huge reward, 10,000 coins. The regular symbols are the Red Diesel, Yellow Diesel, Green Diesel, Gas Can, Gas Pump, Spark Plug, Dice, Piston, Wheel and Steering Wheel. The game also has a Big Red Truck symbol which can substitute for all other symbols to form a winning combination. All payouts for combinations that are completed with the wild symbol are automatically doubled. The wild symbol does not substitute for the Muffler scatter symbol. When two or more scatter symbols appear on consecutive reels, the scatter winning combination is rewarded to the player. Coin ranges in Highway Kings are 0.01 to 5.00, and with a massive 10 000 coins at stake; you are able to win quite large amounts. When you hear the sound of a trucks horn, check you balance because you have probably won a line combo. When you line up five right facing red trucks on an active pay line, you drop the 10 000 coins. The left facing flame truck is the wild card and can earn you some kudos, but not the big prize. The scatter symbol is the exhaust and it will earn you multiples of your bet when you land two or more. The jackpot in this game is triggered by the appearance of five Red Diesel symbols. The second highest jackpot of 5000 coins is for five yellow diesel symbols. The lowest possible payout is rewarded when either one red diesel symbol appears or two gas pumps or two spark plug symbols appear on a single activated payline. This is worth 2 coins.